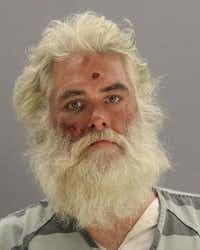 Leonard Rose, hailed as a hero months before he was arrested for a stabbing in downtown Dallas, is a free man. Downtown residents and workers may have in the last week or so noticed the return of a familiar face on the city’s sidewalks. Leonard Rose, whose snowy white beard gives him more than a passing resemblance to Santa Claus, is a homeless man often seen selling the STREETzine paper near the 7-Eleven around Elm and Akard. Last year, in the span of a few months, Rose made the news for two very different reasons. In September, he was a hero, lauded for acting to help two women attacked near a downtown apartment building. In late October, he was arrested and charged with murder for stabbing Anthony Michael Bailes, another homeless man who had reportedly been verbally and physically harassing Rose. What apparently hasn’t made the news yet is that a grand jury declined to indict Rose for the killing, handing out a “no bill” in December. Attorney J. Daniel Oliphant, the public defender appointed to represent Rose, said Friday that the grand jury agreed his client had acted in self-defense. The stabbing occurred on Oct. 31, not long after Bailes began verbally harassing Rose. The harassment turned physical, and Oliphant said that witnesses saw Bailes beat Rose near the bus stop at Elm and Ervay streets. Rose followed Bailes, who again came at Rose near the Gables Republic Tower on Ervay Street. Oliphant said that witnesses saw Rose use a knife to defend himself from Bailes, who died from the stab wounds after being taken to Baylor. Police arrested Rose and charged him with murder. A little more than a month before, Rose was commended for helping two women attacked on a downtown sidewalk. Police said the women were walking when they drew the attention of a “homeless K2 user,” who stabbed and chased the women into the Wilson building, trapping them in an elevator. Rose rushed in to help, distracting the attacker and keeping him in place until police could arrive. Oliphant said it’s those actions that should define Rose, who is “happy and relieved” to be free. “He’s kind of this Good Samaritan,” Oliphant said.